The Chesterfield Food Bank and its five different food programs fed 1,800 people last week. 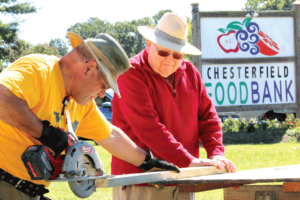 While their focus was on feeding people, two of their partners, Grace Lutheran Church and the Chester Rotary Club, took the weekend to shore up their physical facilities by replacing the roof of their food supply building. Grace Lutheran volunteers the fourth Friday of each month with the food bank’s food distribution program. 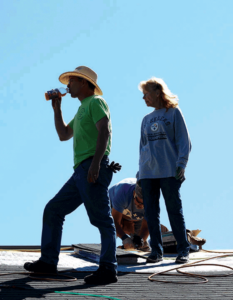 The church volunteered for the roof project financially and physically as a service project. Many members of the church are also members of the Chester Rotary, and they asked the club to partner with the church on the project. 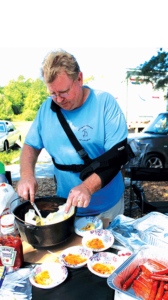 A total of 25 church members and 10 Rotarians were involved in organizing the project, replacing the decking and shingles and providing breakfast and lunch for the crew. Eight years ago, Travis and Karie founded the food bank when they decided to give back a portion of their business profits to young couples, single parents, and the elderly who have been turned away from conventional forms of government assistance or other programs. Over the years the food bank has formed partnerships with businesses, community organizations, churches, and schools. The food bank will have its October fundraising campaign, “Give Where You Live Day,” with an online giving event Oct.25. For more information call (804) 414-8885 or visit www.chesterfieldfoodbank.org.